Historical novels must keep the spirit of History, by Gabrielle Dubois. Whatever one may say, I like Louise Saint-Quentin, the story that freed me. I have a job that is enough for my needs, so no goal of survival forced me to write this story. If Louise Saint-Quentin is valuable to me, it is because at no time did I think that there could be any consequences for this work, be it publication or rejection of publishers, success or failure; since never during the writing, the historical researches or bibliographical readings, did I think that I would let read what became a novel. My freedom of mind was therefore complete; my writing as spontaneous, fresh and lively as a mountain river; my work and its fruits, the sweetest of pleasures since they were only for me. But … I ended up having Louise Saint-Quentin read! Those who self-proclaim intelligent people found it too easy; people in a hurry found too long; carefree people, too difficult; prudes too licentious; people who ignored the late 19th century’s mores, shocking; people who need to classify everything rejected this unclassifiable novel. All this ... flatters me! I don’t write like this or that author, I didn’t follow the courses of this or that teacher, and I don’t belong to any literary trend; my imagination makes some jealous, my work force makes some envious, it doesn’t matter — telling stories with a strong historical background makes me happy. 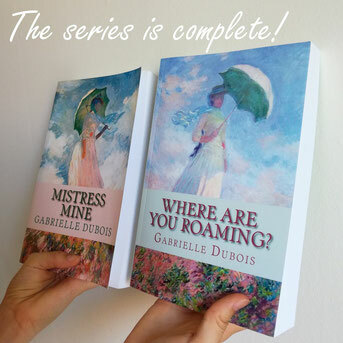 And the readers that followed Louise Saint-Quentin’s adventures, have received this happiness in full pages. I opened up and followed my own path as a writer without asking myself if I was allowed to do it, without asking myself if it would lead me somewhere, without ever imagining to take one of the many paths already traced. And as a path that we open up is like a heart that we offer, readers have joined me to walk together, and this trip is wonderful! For the Louise Saint-Quentin series, the path is the end of the 19th century. Of course, I only went there by reading known and unknown writers of that time: famous authors, anonymous trade representatives, rapporteurs for the Government, whoever wrote what he saw or thought, everything is good to read to soak up the spirit and manners of a time when one can travel only by the thought, comfortably installed in front of his desk. So some may think that they are entitled to judge, according to their criteria of the 21st century, the thoughts and actions of the men and women of that time as of another. I don’t think so. Some may think that the 19th century was romanticism, white-haired writers, political leaders full of wisdom and beautiful quotes, innocent and naive young girls, or married and wise women. Yes, there were some ... as there are nowadays, neither more nor less! But as nowadays, there were men and women free to think and act according to their convictions, according to their desires, according to their heart ... just like nowadays! I will never hide the reality of my characters so as not to upset anybody. Why imagine that our great-great grandmothers were necessarily saints or statues? Our grandmothers also have been young, our grandmothers also were human beings made of flesh and blood. Louise Saint-Quentin is not the story of the women and men of the years 1880-1900, it is a story of some women and some men of the years 1880-1900, as my heart and my mind created them. Readers hate them, others like them, others love them, some are indignant, some are enthusiastic, in any case, they don’t leave anyone cold, and isn’t this the proof that my characters have a consistency, and that the work was not too badly done? If Louise Saint-Quentin is a beautiful story, fresh, young, exciting, spontaneous, full of love and adventures that make the reader travel around the world, I also recognize that its writing has some defects, those of a first novel, those of youth. Before having it translated, I could have rewritten some sentences, but I chose not to do it, for fear of losing that spontaneity that makes all the character and charm of Louise's own character. So I left it as it is: a little rough form will say some, but so full of happiness and fantasy, with delicious, lively and sharp dialogues, and so endearing characters.